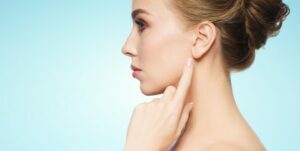 With the arrival of sweater season, Bethel Park plastic surgeons see more patients in need of earlobe repair. Unfortunately, it’s a common occurrence: you go to pull a sweater over your head and it catches on an earring, ripping it out of your earlobe. The good news is at Advanced Liposuction Center we can repair damaged earlobes. Of course, sweaters are not the only cause of ear lobe disfigurement. Gauging or ear lobe stretching is a fashion fad that many people later regret trying. Even years of wearing heavy earrings can leave ear lobes stretched out and sagging. Sometimes, patients are born with misshapen ear lobes. Whatever the cause of your ear lobe damage, a simple, in-office procedure can restore your ear lobe to a pleasing and attractive shape. Using a local anesthetic to numb the ear lobe, our expert cosmetic surgeons will make the appropriate cuts and then stitch the ear lobe into a beautifully contoured shape that suits your face. Following the surgery, you may feel a mild warmth or burning sensation in the ear lobe and perhaps experience some swelling. There can be minor bruising at the site of the stitches about one week after the procedure. Scarring is usually very minimal, but we do offer fractional laser treatment for scarring if you so wish. The plastic surgeon will also give you an antibiotic to take following the procedure to reduce the risk of infection which you should be sure to take as directed. After 6-8 weeks, when the ear lobe is fully healed, you can re-pierce the ear if you desire. Our procedures are all safe and provide beautiful results. To learn more about earlobe repair you can meet with one of our cosmetic surgeons for a free consultation. To make an appointment at one of our Pittsburgh area offices, contact us by calling: 724-683-7581.